In order to fairly grade each of your students, provide them with a rubric clarifying expectations: both what you – the teacher – expect from your students and what the entire school community will expect of them as budding scientists sharing their results. Here is a sample rubric you can use to grade/judge student science projects; (tweak or revise it in whatever way is useful). Explain to your students that scientists present their findings at conferences and in research journals and the school science fair is no different. As scientists, they will present their findings to their peers and the larger school/local community. 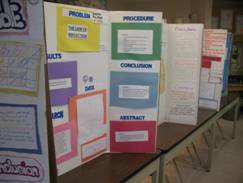 The science fair is a springboard and practice ground for exemplar research projects. Again, GOOD LUCK and HAVE FUN!!!! Is your project grade-level appropriate? Discussion – What would you have done differently? What obstacles did you face? What could have altered your perception or the results of this experiment? Further Research /Application – What other experiments could you do based on the results from this experiment? / How does experiment relate to real-world? Did you use a tri-fold display board? Did you have a picture or actual display of product/experiment? Were titles and headings clear and outstanding? Was your written explanation neat, typewritten, and without grammatical or spelling errors? How well did you explain the purpose/goal of your project? Could I replicate your experiment based on how you presented it? Click here for a pdf version of this rubric.